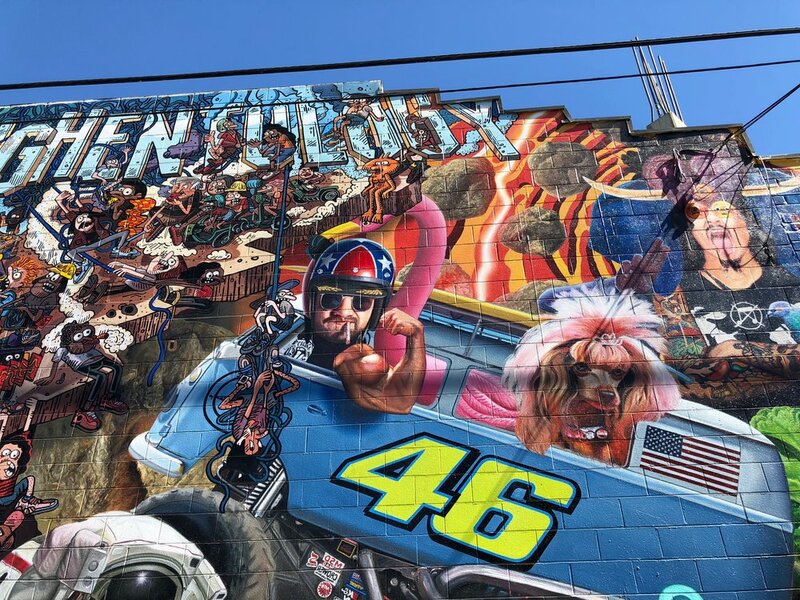 A detail from artist Kim West's Only One Way Through building mural at 901 East 3rd Street in the Los Angeles Arts District. All images in post captured by Dorothy Barenscott. Our guide, Hector Calderon (aka Shandu One), is a pioneering LA street artist and served as our guide on the 2.5 hour tour. 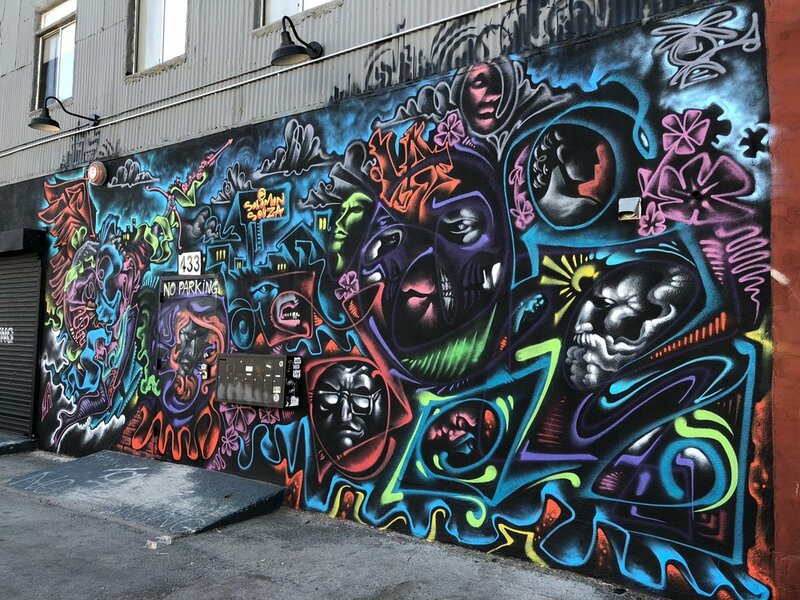 One of the highlights of my recent trip to Los Angeles was the opportunity to visit the LA Arts District, and more specifically, to be toured around the vibrant street art scene. Much like in New York, the city that gave birth to contemporary street art via a long and rich history of urban graffiti married to street and hip-hop culture, Los Angeles has played an important and influential role in shaping the visual vocabulary and emerging trends in today's vibrant global street art scene. In recent decades, social media and image sharing on the Internet have only accelerated the pace of experimentation, together with the involvement of a diverse and new cross section of the visual arts community. I booked my tour through LA Art Tours after some research into the best options for knowledgeable guides. Reading through the reviews, I was immediately impressed that all of the tour guides are practicing artists working in the neighbourhood. When we arrived on the sunny Saturday morning of our tour, we met Hector, aka Shandu One, and learned that he had formed one of the original graffiti crews back in the 1980s, the LA Bomb Squad, and was among the pioneering graffiti and street artists of the Los Angeles scene. 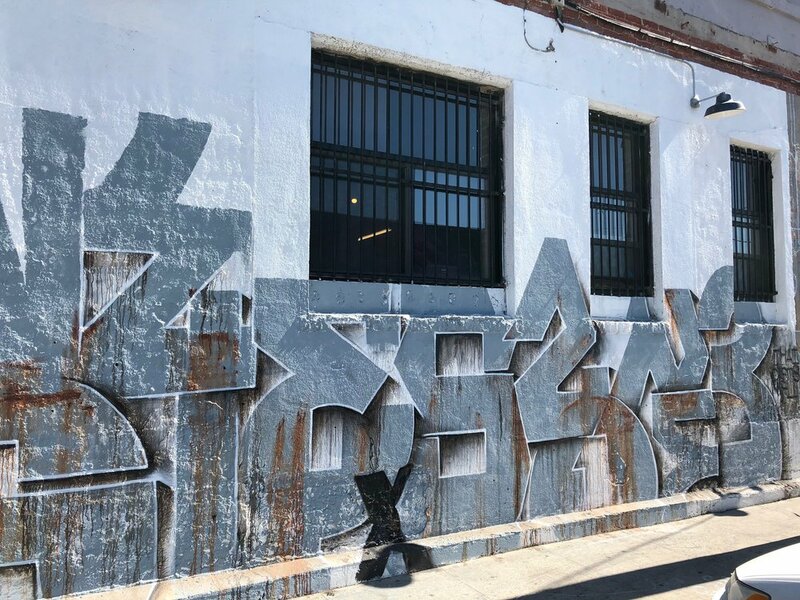 Today, he continues his practice inside and outside the studio while mentoring young street artists and educating the public about LA's street art history. 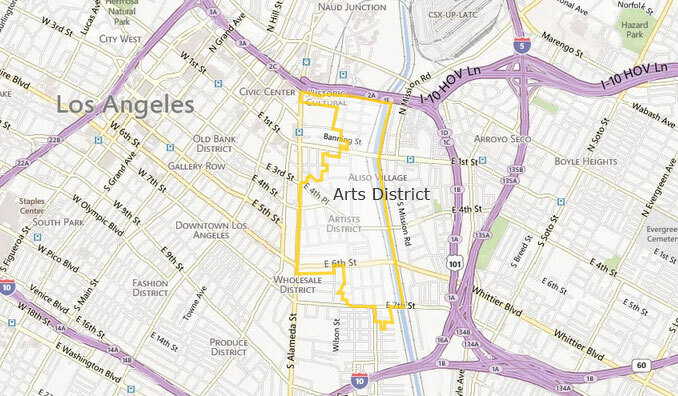 The LA Arts District lies to the east of the main commercial hub of downtown LA and is a neighbourhood undergoing profound transformation as a result of urban gentrification. 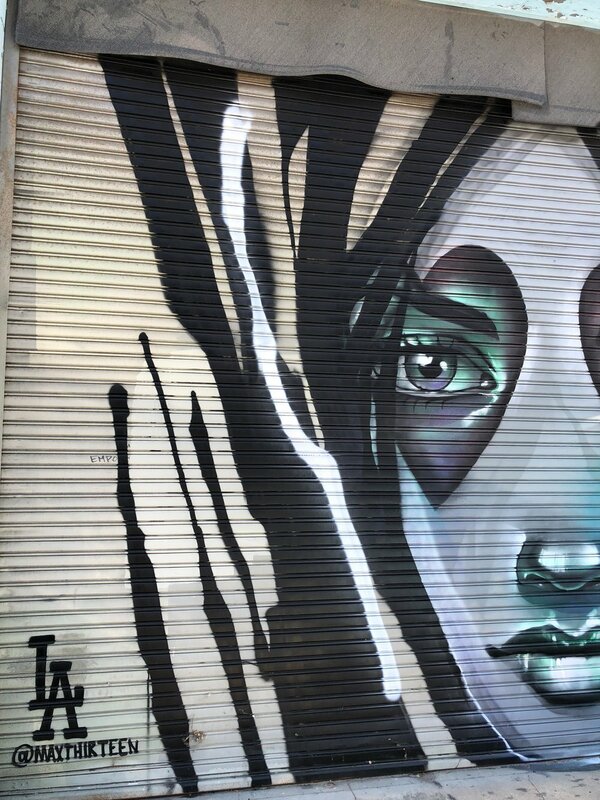 The LA Arts District is an area in downtown Los Angeles that lies to the east of the main commercial hub of the city. Traveling there, we were warned about the severe homelessness and tent cities that took up several city blocks on the streets bordering the district. Being from Vancouver, this was sadly not at all unfamiliar, but it was clear that a tide of gentrification was squeezing the city's poorer populations into a smaller space. 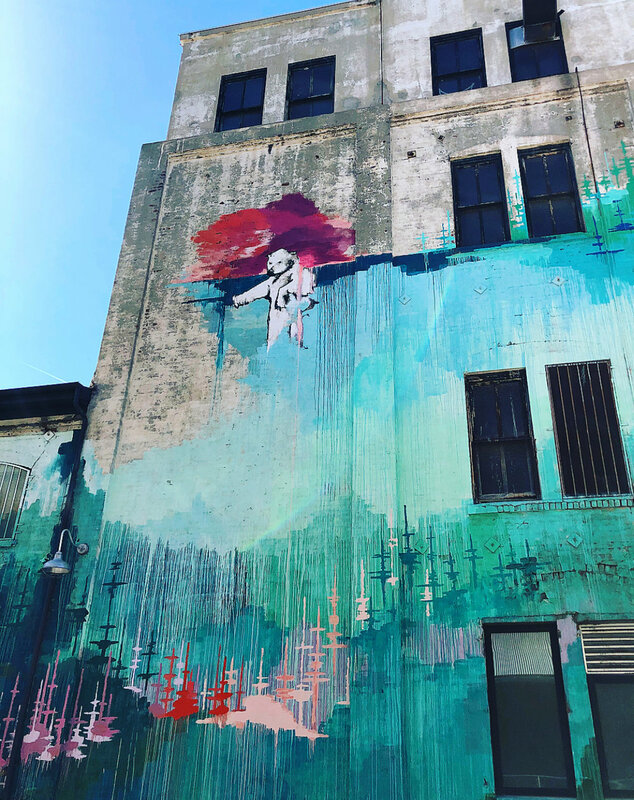 The Arts District itself is an urban neighbourhood in transformation and has been populated by artists seeking cheaper rents and access to studio space for many years. It is also unusual in the landscape of LA as being a very walkable part of the city. Parking your car and moving on foot is not the norm, but the demand for city living, as Hector explained, has transformed the District in recent years as developers seek new projects in a heated real estate market. Moving through the streets, back alleys, and other niches of the District, I was immediately struck by the diversity and experimentation of the street art that we saw. Listening to Hector, we learned about the give and take, and unspoken rules of conduct among the street artists working the area, and he pointed out many important nuances about the painting techniques and various approaches to style and content that were on display. While it would be impossible to definitively categorize all that was there, my art historian impulses kicked in and I was able to note some commonalities and reflect on the uniting features of the scene. For more information about the artists featured below, please see this useful guide provided by LA Art Tours, and in my image galleries below, simply click on any image to see up close in a shadow box. One of the first things I noted purely at the level of form was the predominance of a lighter and more neutral/cool colour palette on the walls. 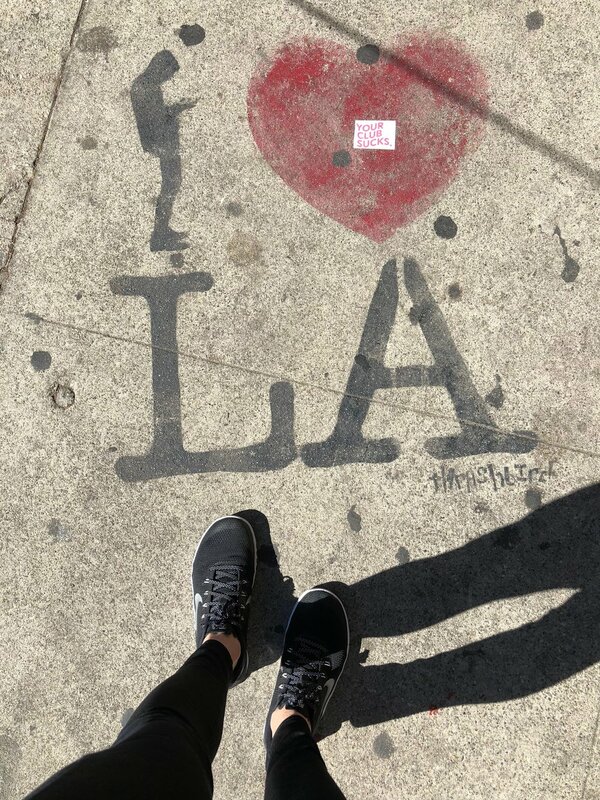 Being in hot and sunny Los Angeles, it makes sense that the contrast of cool/neutral would pop against the warmth of the sun and play well with the deep shadows that crept across surfaces over the course of a day. Also notable was the move away from purely figurative forms to experiments in abstraction, dripping, and repeated patterns. Many painters were clearly working with ideas taken from the studio, and Hector described how many of the artists worked with stencils, projectors, and other computer-aided designs to achieve their final effects. He also kept reminding us that much of what we saw was achieved using spray painting alone, or paint pouring and mixing, without the help of any brushes, and often painted in tight time frames. Murals taking up entire buildings are another important feature of the LA scene. As ready-made canvases, the building owners in the area often work closely with artists to negotiate and approve many of the large-scale designs. 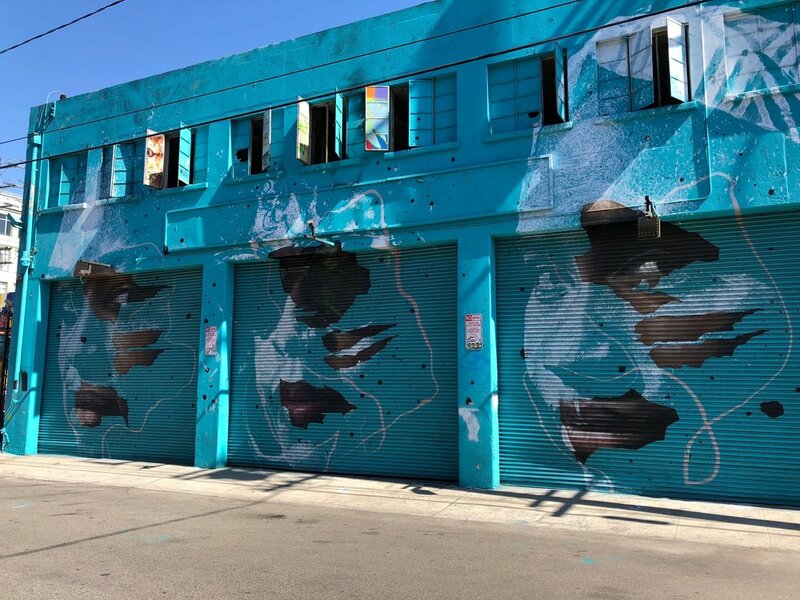 Importantly, artists appear to pay close attention to the architectural elements of the built space (including how the sun will hit the facade at different points in the day) to render murals that are dynamic and experimental. I was struck by how clean and untagged many of these murals were, and we learned that there was an active effort to monitor and clean up the murals and/or come to agreements among local artists to allow individual projects to have their moment in the community. While the predominance of cleaner and more accepted street art murals was the norm, it was great to see a diversity of old school graffiti and tagging culture represented everywhere in the District. Hector decoded almost every tag as we walked the tour, and provided context and background about the graffiti crews and other individuals who continued to work in the old school styles of the original LA street art scene. There are also areas known as painting gardens where crews practice and hone their techniques. Art is everywhere in the District-- paint, stickers, wheatpasting, and markers are attached to every surface-- on the walls, on the street, on the poles, and on the ground. 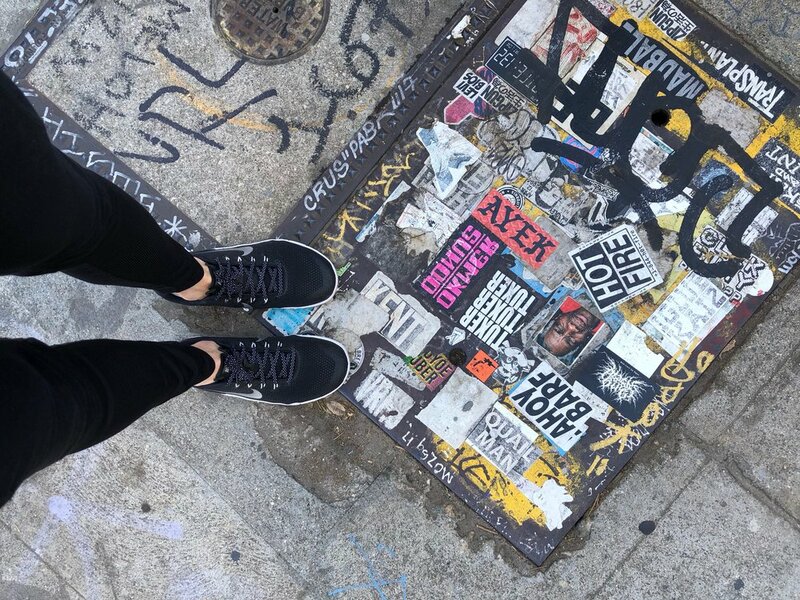 At many points along the tour, I was completely distracted by what I saw under my feet, and I do not think I have ever seen as much attention paid to the sidewalk as the walls in any city I have visited. 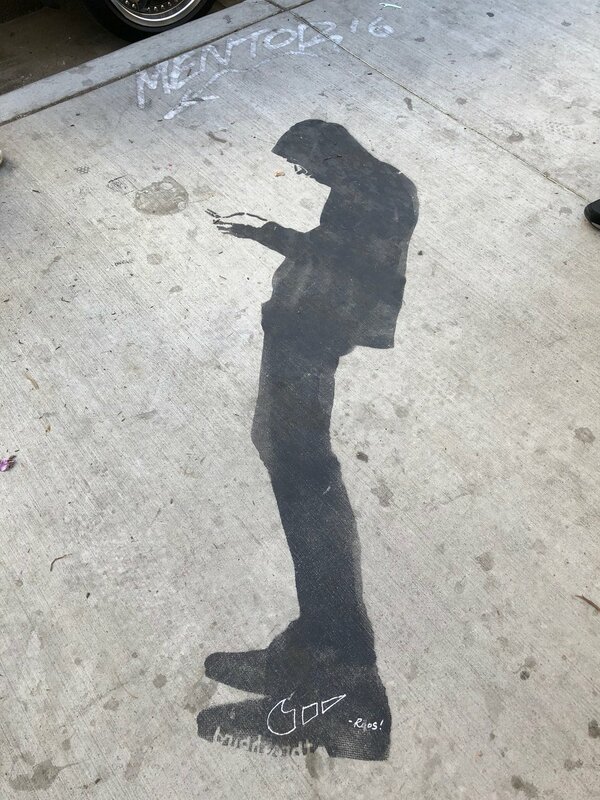 Hector pointed out the evidence of conversations between artists, and how to read the various tags as they accumulated, especially on the ground works. This dimension of street art alone is worthy of separate study! Another striking aspect was the use of Instagram account tags to effectively provide visual signatures of works. As a very effective social media strategy to both connect artists and also circulate and distribute imagery, I found myself looking up and following many of the artists we came across on the tour. 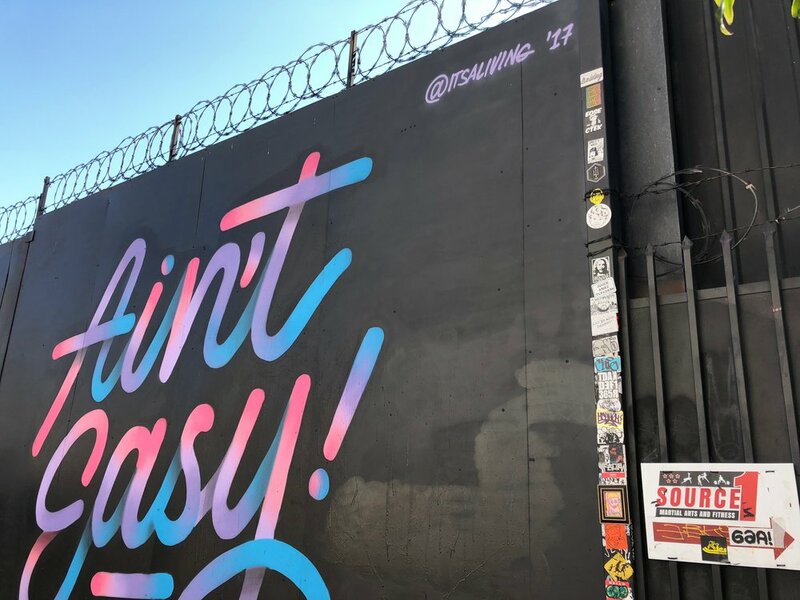 The history of LA's street art and graffiti scene has deep connections to, and intersects with, many social and political issues in the city. Today, concerns around gentrification, racism, homelessness, and income inequality in LA are exacerbated by Trump's presidency and the crack-down on illegal immigrants and the defunding of the arts. 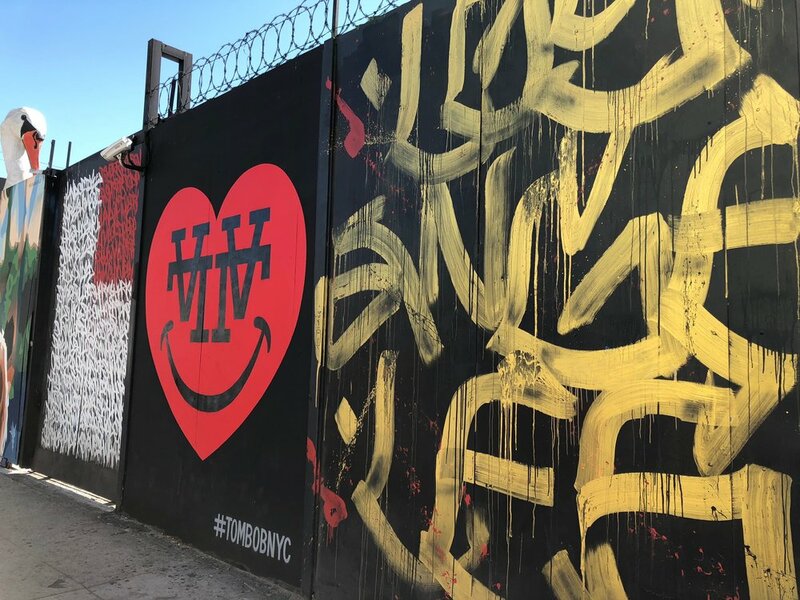 Everywhere we looked in the District, there were direct visual reference to the social and political tensions of the city, as well as artist activism on a global scale. As I described at the begging of this post, the pressures of gentrification have started to transform the area we visited, and it was seen everywhere in major condominium and commercial development. When I asked Hector what percentage of the new buildings had to be put towards affordable housing, he shared with me that it was only 4%, and that much of that could not be used as the live/work space favoured by artists. As we walked, we also noted many of the new commercial art galleries in the area that sat alongside trendy new restaurants and bars. 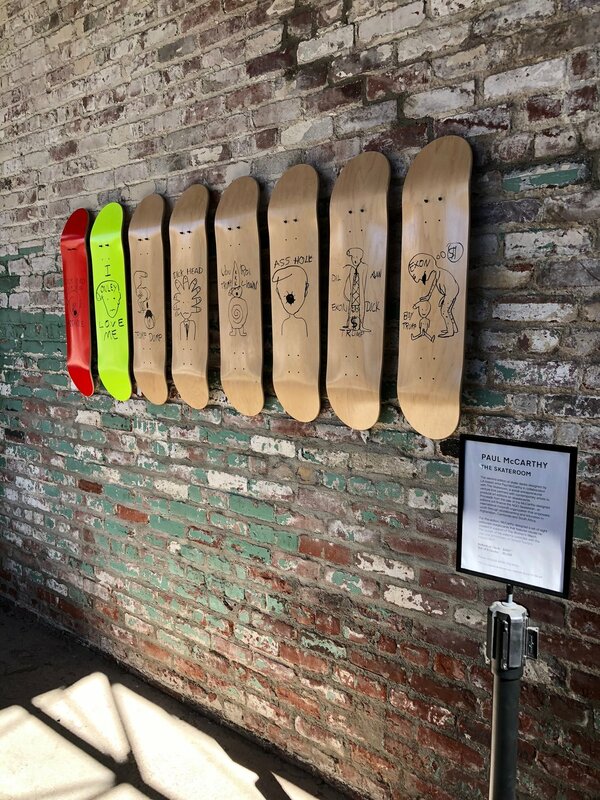 Hector told us how many of his friends were now represented by galleries and showing around the world, and how the LA street art scene was getting global attention. As it was a gorgeous sunny Saturday, we saw many people enjoying the patios and brunch spots popping up in the area. Bloggers also used the murals as backdrops for photo shoots (the painted wings on many buildings were especially popular), sending out images across social media. Interestingly enough, I also spotted two art projects in semi-public areas of an open art space by contemporary and well-known artists Pipilotti Rist and Paul McCarthy, demonstrating how fluidly the world of "high" and "low" art converge in the LA Art District. Reflecting on my visit, I see how profoundly the image culture of the Internet and social media has changed the perception of street and graffiti art. Two years ago when I taught a special topics course on the topic, I encouraged students to utilize the Google Street Art Project to explore and research street art around the world. Later, when I lead a field school to New York, some of these same students were able to expand their knowledge while residing in Brooklyn and seeing the artists at work close up (some even making their own mural!). And while the pressures of gentrification challenge art communities like the one I visited in Los Angeles, the vibrancy and importance of the scene cannot be dismissed. As Hector told us, the attention paid to the art and artists in his community, along with the legitimacy it brings to their voices and concerns, is the most important win for the scene.